Ah, wow, I didn't know his games were on that site! I guess I was only looking at the "spotlight" section, which can be misleading. Haha, probably. The site also has most of cactus's, cly5m's, darthlupi's, etc. games, which are all good. Sorry for derailing your topic! no need to apologize, you were just being honest. Forgive my double posting, but I got a small update for tonigh-... this morning. It's name is Noin and, well, it acts a lot like the ghost that appears when you're taking too long in Bubble Bobble and T.A.C. from Kirby's Super Star. He's a lot less terrifying than I just made him sound. Oh, and in this screenshot, you can see the two Slots on the HUD along with two passive abilities gained from bosses. I just realized that the dream I had last night contained your HUD. Yussssss. I'm working in the caves right now and I think I'm starting to get the hang of it. I've fleshed out Noin some more and added a new baddie. As you can see, the new baddie acts like most bat enemies in videogames. If you go under it, it drops down and starts attacking you. after floating after you for a few seconds, it curls into a ball and dashes at you. very dangerous in this spiked cave setting. As for the update to Noin- now he will follow you around until you gain an ability. if he catches you and you have an ability, he will steal it and leave. I'm thinking of making him invulnerable as well, because the cave stages are the start of the last quarter of the game and I want it to become much harder at this point. 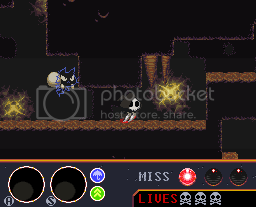 As you might notice, I've shown a new ability in these screenshots, and that's Burrow. Burrow is one of the defensive abilities that you can get. By itself, it's somewhat useless. you press down, and you will burrow into the ground, hiding from enemies like a coward, as you can see I've done to avoid Noin in the bottom left screenshot. You can't normally travel underground with this ability, only stationary hiding. Paired with an attack ability, the burrow makes you into a stealthy killer, letting you attack from underground. 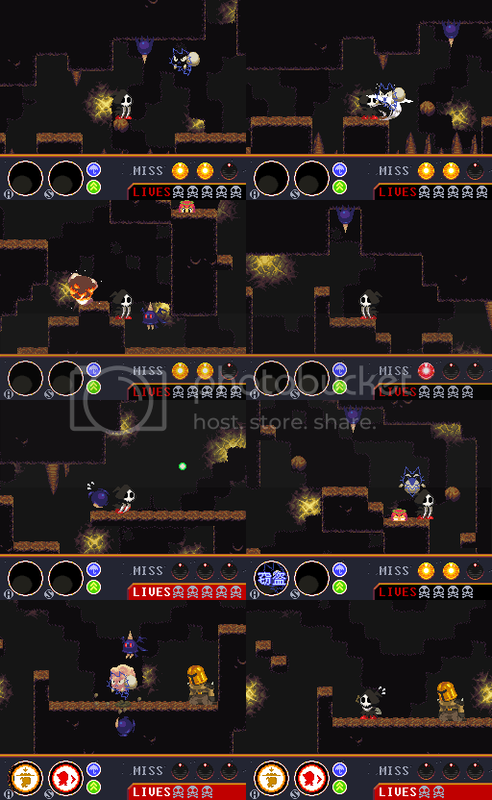 In the case of the combo you see in the screenshots here, I would be able to burrow underground and then jab a spike upward into any enemies that happen to walk over me. I'm just impressed with how fast you're making this. Those caves are coming together nicely. Still not quite sure about the invincible ghost, though; methinks he could get quite annoying without a way to counter him (ironically, I didn't mind the ghost in Spelunky, but only because it was a measure to add urgency to the game, not weaken the player). And great idea with Burrow; I look forward to being able to play as a Lurker from Starcraft. This thread continues to entertain and amaze me. I envy your work ethic man. Thank you very much, Dustin. I appreciate the encouragement. First off, if you don't have an ability, touching him doesnt cause any damage or anything, he simply bounces off of you. He doesn't simply float toward you, he gravitates toward you, so if you jump him or dodge, he'll shoot right past you. And if he does take your souls, he leaves the room for good. I've been watching my brother play our SNES again, and I noticed that a lot of SNES games had a slightly higher framerate than my game has. The games in particular I watched him play were Super R-Type 3 and Wild Guns. I'm thinking of changing my game's speed from 30 to 35 to mimic this. Would bothering around with frame-rate really affect anything significantly? I'm sure the game is beautiful as is. Also, the Noin enemy is probably one of my favorite ones so far, conceptually. Glad to see you got it balanced out so I can enjoy it in-game, too! I just got finished making the overall speed to 35 and it runs a lot smoother. It made a big difference! And thanks. I've been putting a lot of work into this one enemy, huh. To be more accurate, an SNES typically displays at either 50hz (PAL), or 60hz (NTSC). There's a visible difference between 30hz and 60hz, but some may find it difficult to discern (you can see a comparison here). And because most modern LCDs run at 60hz, it's best to use something that divides evenly so as to minimize screen tearing. The game looks great, and I especially like the main character design. Not sure how well the title screen fits, though. It brings to mind Contra, not very-menacing-yet-somehow-cute ghosts. Thank you for the interesting technical lesson. I suspected the SNES had a higher framerate than I was using, and you've confirmed it. I only allowed myself to go up to 35 because any higher makes the game feel like it's going too fast. I had designed the game so far using 30 speed, so bringing it too high kind of messes up the flow of cutscenes and boss fights. Oh, the title screen's come a long way as well. The original title screen I used had "JACK" in big silver bubble letters, and then I tried making it look like it was made of metal with a sharpened edge on the bottom- alluding to a scythe. Eventually, as I was making the LET'S GO and FINISH sprites, I decided to redo the title. I don't know if I've mentioned it before, but the red cross on the title screenshot you see at the beginning of this thread is animated- It slowly rotates and fades away, like a bright red beacon. I personally think it fits well with what I'm going for, but to others it might not see the same thing because there's no context yet. The game is going to be split between "serious" and "cute and fun" as you could probably hear from the music I've put up. I'm trying to make a good emotional contrast in it, so sometimes you'll be having a good ol' time, and then things suddenly get real. Sorry I haven't updated in a while. I had someone visiting me and I didn't think it would be polite to be working on a game while he was here. Anyway, I might as well post an update to what I'm currently working on. I've been wanting to do something like this for a while now, but I've been so immersed in developing the caves and it's enemies that I didn't have the time. This is going to be a simple background component in the plains stages, since they've been lacking in that sort of thing. 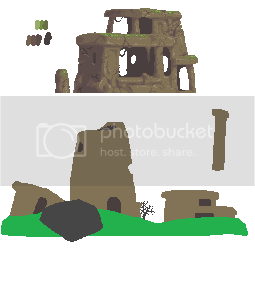 I did a quick google image search for "island ruins" and used those results in general as inspiration. Obviously, the bottom parts aren't done. Quick question- can moss actually grow on top of ruins like that? Either way, I like how it looks. I'm just curious. If you leave ruins alone long enough, they will have a bunch of plants growing from the roof due to the seeds floating on the wind. It's entirely plausible that there can be plant life on ruins depending on the location. OK, everyone. I've finally got over my insecurities and made myself put up a playable demo. And by "demo" I mean, you can play as far as I've made. The music is not put in yet (since I have no idea how to even use the gamemaker pxtone thing) and there's only one sound effect put in, which is the boomerang sound. um... yeah, that's all I can think of to say here. Check the opening post of this thread to find the download link. Are you saying they stop doing anything whenever you hit them with the boomerang? That's not right... they should get stunned for a second, then continue moving. Also, the boomerang does the same amount of damage as your basic attack, and you can fire it at almost the same rate. later on, when you can combine abilities, they get even more powerful and useful. The boomerang is good, but not in tight spaces. The stages are short? hmm, how far did you actually play? the first two or three stages are tutorial stages that just show you the ropes, so they're very short. Lemme retract the 'too short' complaint, they are a good length after said tutorial levels. As for the Boomerang, I imagine that they WOULD only be stunned for a second, but each hit seems to reset the stun. Also, it looks like you have the Boomerang limit to three on screen at a time? If that's the case, then whenever one hits an enemy, you can fire another, and another, ad infinitum.